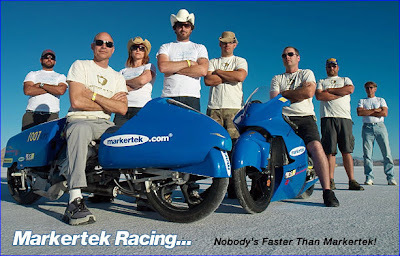 This past September, I had the opportunity to go to the Bonneville Salt Flats for the Bub Land Speed Trials with the Markertek Race Team. To say that it was an amazing experience would be an understatement. It was unlike anything I have ever experienced in my life. The whole trip was epic- from driving the rig out to Utah from New York, to capturing FIVE records, to seeing the full stream liners make their runs, to flying kites outside the Wendover Nugget Casino, to... I could go on and on, as everyday was filled with new experiences, new sights, and new friends. A major heartfelt thank you to Markertek! Without their support, our team could not have been as successful as we were! Below, are some photos I took out on the Salt Flats. There are more on my Flickr page. The very talented Gregor Halenda took these photos and the photos on the Markertek site. Scott Kolb waiting his turn to make a run. Scott is given the green flag and a starting push from Tom Romano. There is a lot of time spent waiting in the pits.